Texas at Hamburger’s Majestic Theater in “The Kissing Girl,” 12-18-1910. Los Angeles Times. Hamburger’s Majestic Theater, 845 S. Broadway, affiliated with Hamburger’s Department Store (later the May Company), opened in 1908. LAPL. Texas was back in March of 1912, having joined the “beauty chorus” of E.A. “Pop” Fischer’s musical stock company, Fischer’s Follies based at the Lyceum Theater (formerly the Orpheum) on Spring Street. Texas Guinan playing alongside Lon Chaney and others as part of Pop Fischer’s stock company in March 1912, based at the Lyceum Theater. Los Angeles Times. 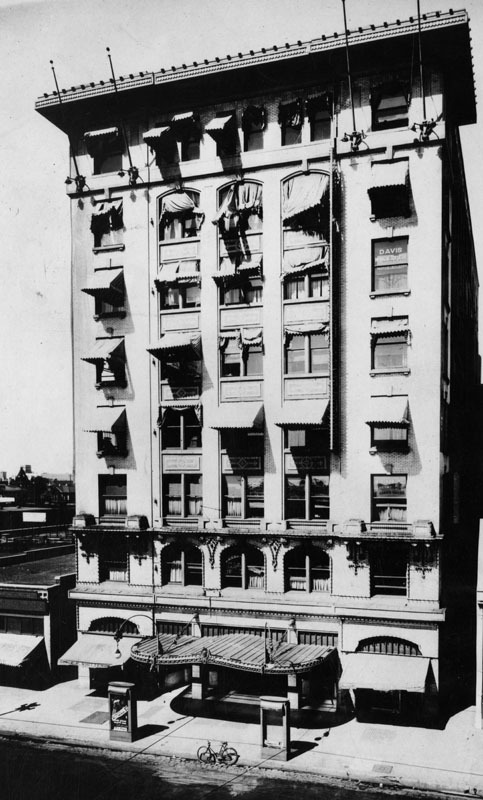 The Lyceum Theater, 227 S. Spring St. opened in 1888 as the Los Angeles Theater. 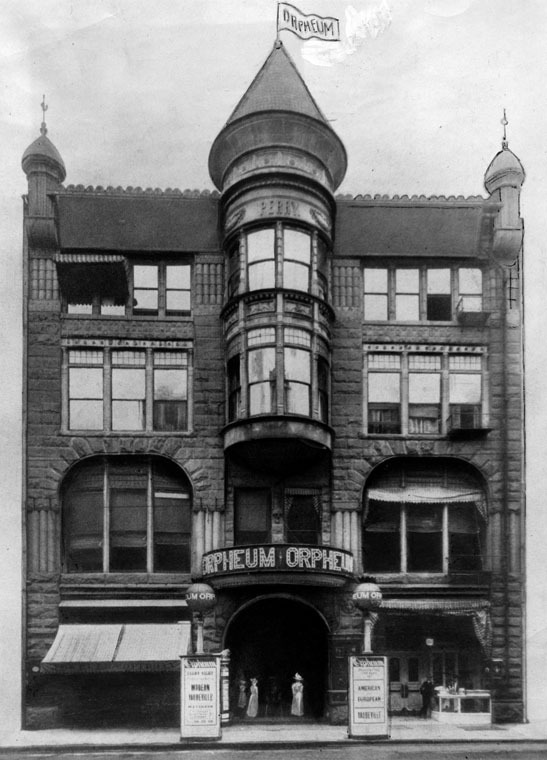 As of 1911 it had become the home of the Orpheum circuit. Pop Fischer took it over in March 1912. LAPL. “Make them smile!” she told Los Angeles Times columnist Grace Kingsley when asked the secret of her success in a July 1912 interview. “Make ‘em feel as if they were at your house at a party and let ‘em have all the ice cream and cake they want! Forget your sore heart and your sore toe and make ‘em smile!” Ten years later she would apply that same philosophy to her night club business. The beauty of Texas’ eyes and smile highlighted by the Los Angeles Times‘ Grace Kingsley, 7-9-1912. In 1913 Texas endorsed a miraculous “fat cream,” but claims that it could bring about weight loss without dieting or injurious drugs were, not surprisingly, soon called into question and in 1914 the Los Angeles-based manufacturer was prosecuted for mail fraud. “Dauntless Texas Guinan, who triumphed where Ponce de Leon failed” endorsing Texas Guinan fat cream with an “evangel’s message of physical salvation for all fat women of the world!” 9-14-1913. The spirited brunette was a favorite with Los Angeles audiences, if not so much with critics. In December 1916, she married one of them, Julian Johnson, who while based in Los Angeles had panned one of her performances. 12-18-1916: Texas married a Los Angeles-area drama critic Julian Johnson who had once panned one of her performances. Los Angeles Herald. By this time, the bride had returned to New York, appearing at the Shuberts’ Winter Garden Theater. She was back in Los Angeles as of August 1917 to make movies. While here, she appeared with Mary Pickford, Charlie Chaplin and others at a WWI benefit show for the French wounded at Mason Opera House. 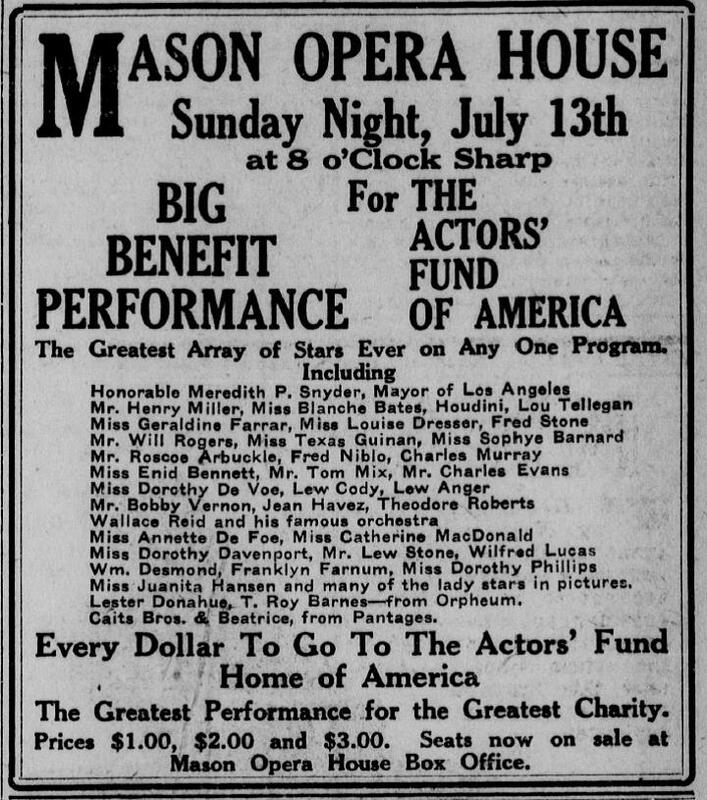 She was on the Mason Opera House stage for another star-studded benefit in September 1919, this time for the Actors’ Fund Home. Texas Guinan again appeared on the Mason Opera House stage with Los Angeles Mayor Meridith “Pinky” Snyder, Houdini, Lou Tellegan, Will Rogers, Fatty Arbuckle, Tom Mix, Lew Cody, Wally Reid, and many others for a performance to benefit the Actors’ Fund Home 9-13-1919. Los Angeles Herald. During WWI, Texas gained new acclaim as a Western movie star. Although most women who appeared in the genre were there mainly to be rescued by the hero, Texas’ characters tended to do their own rescuing, thanks, and plenty of shooting, earning her the title of “female Bill Hart,” or “the cowlady of the screen.” In November 1919, Grace Kingsley reported that the former stage star had “oiled up her trigger finger” and signed on to do some 2-reeler Westerns for the new Bullseye Studio, beginning the next month. In 1921 she formed her own production company, Texas Guinan Productions, and in September of that year it was reported that she’d completed the first of 24 planned shorts, Texas of the Mounted. The following month, Texas made headlines when she was taken into custody at her Beverly Hills home, 907 Beverly Dr., and held in the Los Angeles County Jail on charges related to a bad check for $48.92 she was alleged to have written her grocer in May 1920. A few days later she was exonerated of the charges, the court noting that she never should have been arrested in the first place. Texas, in the first of many “jail performances,” was held overnight in the Los Angeles County jail on October 21, 1921. Los Angeles Herald. Not long after the incident, Texas left again for New York. Through the connections of an old friend, Nils T. Granlund (“NGT”), then affiliated with the Loews Theater chain, she returned to the stage. In August 1922 she was back in Los Angeles with her own western-themed touring show, Spitfire, at the Loew’s State Theater. At the conclusion of her performance, she was arrested for having attempted to sell her car, which had a mortgage attached to it. Guinan, wearing a French silk hat, green silk dress and ermine stole, puffed on a cigarette and chatted with reporters outside the courtroom. “I’ve been in Los Angeles 37 times and every time I come I get into some little trouble like this.” she complained. 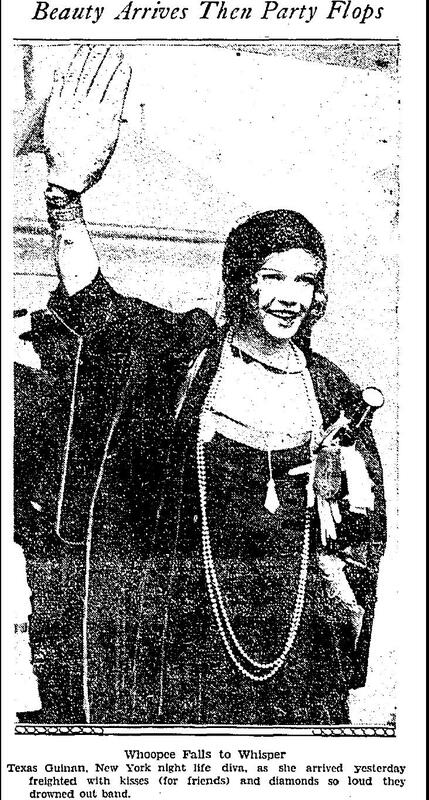 Texas Guinan, “The female Bill Hart in Person,” appearing at Loew’s State Theater 8-3-1922. She was arrested on stage. 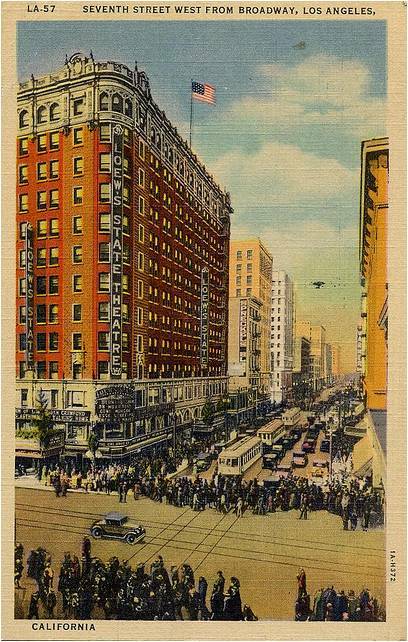 Loew’s State Theater at 7th & Broadway, Los Angeles, opened in 1921. The matter was cleared up, but Texas, perhaps wisely, steered clear of Los Angeles for a while. Back in New York, she collected a huge following as hostess of a small nightclub, the Beaux Arts, on Fortieth Street. Through NGT, she got a gig as the emcee of the El Fey nightclub, owned by bootlegger/taxi cab magnate Larry Fay. Like movie Westerns, the emcee business was then male-dominated. “So these night clubs, nite spots, speak-easies, joints and second-floor jonnies popped up all over the Broadway belt after Guinan’s spot set the pattern. Texas (middle, left) in action. NYPL. Los Angeles had to be content to glimpse her on screen in Paramount’s 1925 production, Night Life of New York, featuring scenes of Ben Bernie’s orchestra performing at all the jazziest spots along Broadway’s Great White Way. 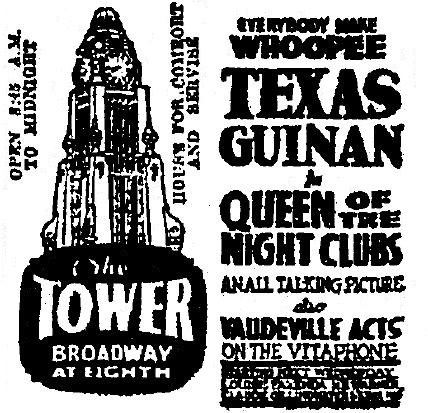 Texas had an uncredited appearance in Night Life of New York, which opened at L.A.’s Metropolitan Theater 8-1-1925. The El Fey was eventually raided and padlocked by federal prohibition agents. By February 1927, Texas had her own nightclub, the Three-Hundred Club on W. Fifty-Fourth St., one of several she would operate. It was raided in the wee hours of February 17. Federal prohibition agents seize a small quantity of “asserted” liquor and hauled Miss Guinan off in the paddy wagon while the orchestra, at Texas’ urging, played “The Prisoner’s Song.” Texas, who gave her age as 38, “entertained the 100 or more persons who followed her to jail with impromptu selections of popular songs.” The charges were dismissed. The spectacle of a grinning Texas Guinan, dripping with diamonds and furs, being hauled off in a paddy wagon became as much a symbol of the era as prohibition agents pouring barrels of whiskey into the street. 2-10-1927 Texas Guinan meets Sister Aimee. Los Angeles Times. Later that summer, Texas launched a revue, “The Padlocks of 1927” and took to wearing a necklace made up of padlocks. 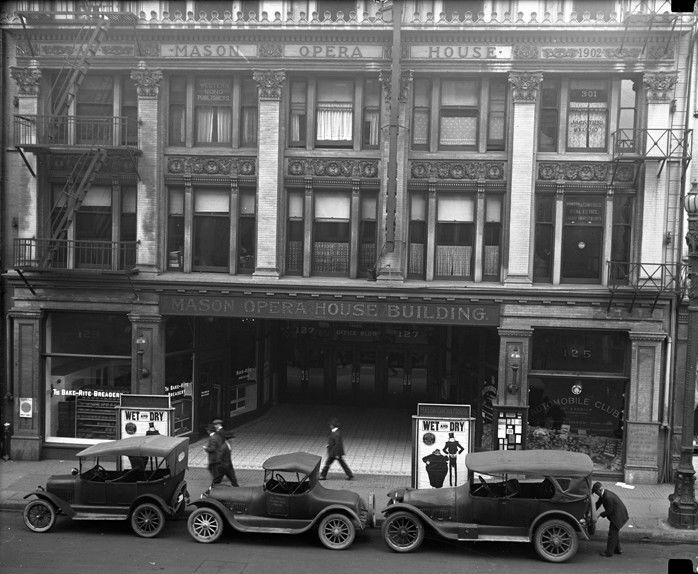 After the show closed, she had a club in the basement of the Century Theater, “a sort of circus, with a calliope, shooting gallery, fishpond, and dart-throwing board” according to Stanley Walker. More raids and padlocks followed. By July 1928, Texas was running the Salon Royal when she was included in a sweeping federal indictment of some 138 Volstead Act violators along Broadway’s “Great Wet Way” after a series of raids ordered by Assistant U.S. Attorney Mable Walker Wildebrandt. Guinan was released on $1000 bail. In August she returned to her former adopted home town of Los Angeles to make a talking picture. 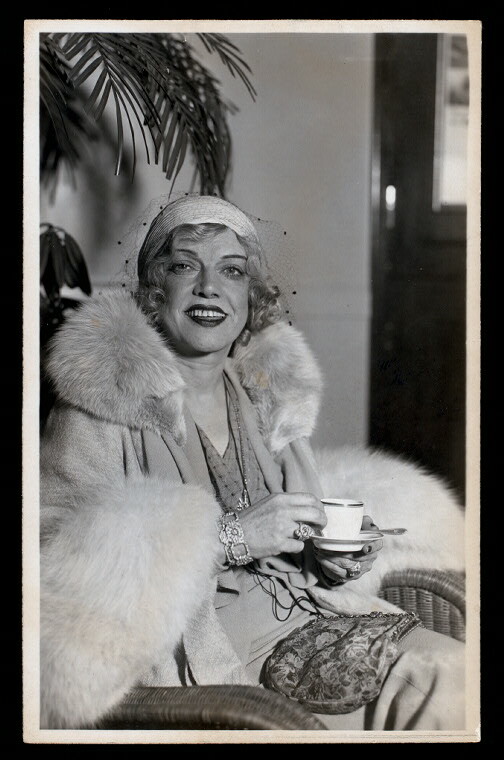 Arriving by the Santa Fe Chief on August 31, 1928, she joked with reporters about her recent troubles, quipping that if the nightclub business didn’t work out, she could always get a job as bridesmaid of the (much married) Follies beauty Peggy Hopkins Joyce. She said that she hoped to pay a return call on Aimee Semple Macpherson at her Angelus Temple. Despite her bravado, Texas had received a stinging rebuff from the offices of Mayor Cryer, when her “publicity man” tried to get the mayor to be part of Guinan’s welcoming committee. The mayor declined. As a further insult, The Breakfast Club, which was supposed to have hosted a “big blowout” for her arrival had pulled a no-show. During her stay, having rented the house of actress Marie Prevost house on N. Camden Dr., Beverly Hills, she regularly attended the Friday Night Fights at Hollywood’s Legion Stadium. She was seen partying at the Montmartre in Hollywood and at Frank Sebastian’s New Cotton Club in Culver City. On October 14, she appeared live in person on stage at the Loew’s State Theater, addressing persons she recognized in the audience with her trademark “Hello, sucker!” and egging them on to applaud the other performers, the most popular of which was “hoofer” George Raft. Afterward, there was a screening of Buster Keaton’s The Cameraman. Texas Guinan personal appearance at the Loew’s State. 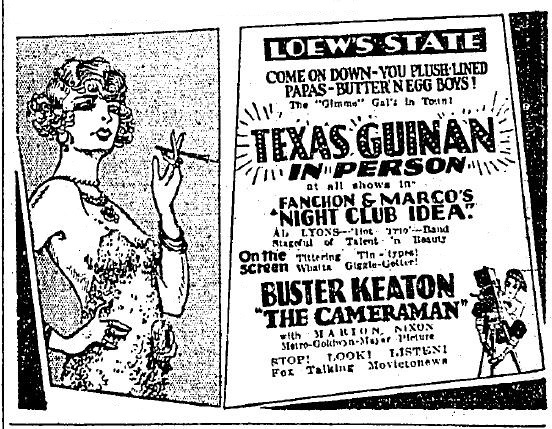 “Come on down you plush lined papas- Butter ‘n egg boys!” 10-14-1928. Los Angeles Times. Guinan cut short her $1500 a week her engagement with Loew’s, claiming she had come down with laryngitis. Loew’s threatened to sue. Texas turned the tables on Loew’s, suing them for $25,000 for “questioning her sincerity.” The suit was settled against her in May 1929, but Loew’s also lost their cross-complaint. Texas testifies 4-11-1929. Los Angeles Times. 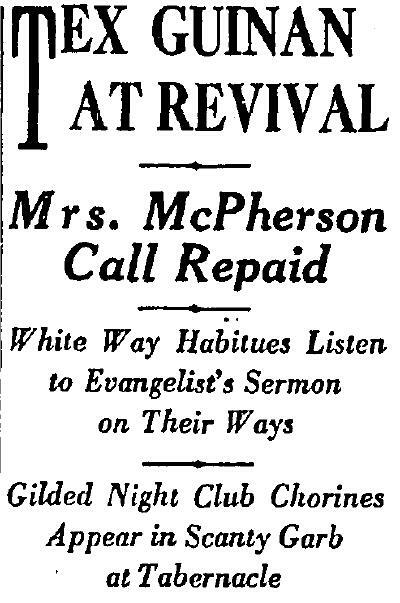 In April 1929 she was back in court to face the liquor charges related to her July 1928 indictment. Under oath, she denied having ever sold liquor, or that she had ever had a drink in her life. She claimed to be unaware that liquor was being sold in the club, but admitted customers brought suitcases of “what looked like liquor” and served it themselves. Some said it was one of her best acting performances. The court, anyway, was convinced. At the same time, her talking picture, Queen of the Night Clubs, in which she appeared as “Texas Malone” premiered at the Tower Theater in Los Angeles. George Raft also appears in the film as a nightclub dancer. 4-17-1929. Queen of the Night Clubs comes to the Los Angeles Theater. 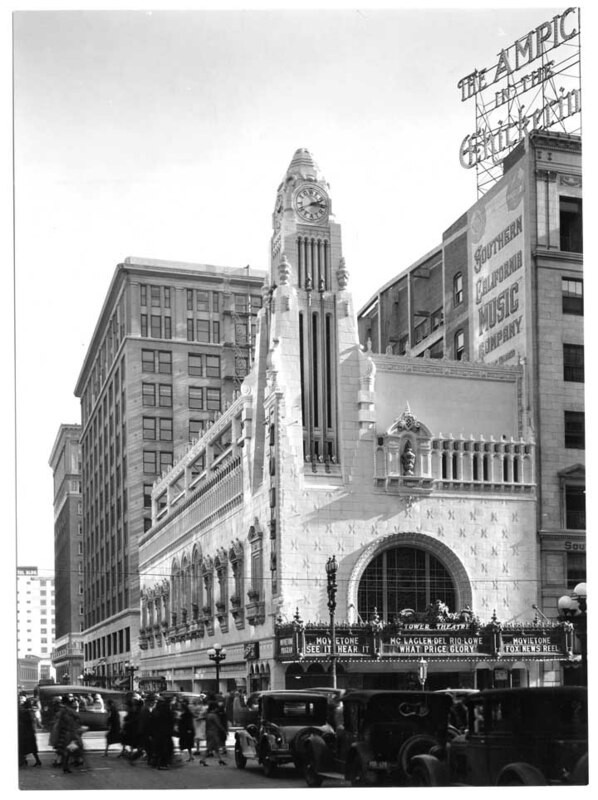 The Tower Theater, 802 S. Broadway, when new c. 1927. CSL. If the Stock Market Crash of October 1929 rubbed some of the glitter off Broadway night life, the new decade seemed to bring a spate of bad luck to Guinan. In early 1930 she appeared as a guest host at the notorious (gangster owned) Green Mill in Chicago. During her farewell performance, March 23, 1930, former Green Mill owner Leon Swietzer was shot by Harry A. Vollier, Texas’ former manager, then current proprietor of the Green Mill, in a dispute over the club’s lease. Guinan, hauled to the station along with other suspects, wasn’t held. On January 24, 1931, Charles “Chink” Sherman, who had once been in the nightclub business with Larry Fay, was shot and stabbed during a brawl at the Club Abbey, formerly Texas Guinan’s. (1). In 1932, Guinan was passed over for the role of a glitzy Texas Guinan-type nightclub hostess in Night After Night, which would have reunited her with “hoofer” George Raft. The role went instead to Mae West. Poster for Night After Night (1932) with Mae West as a Guinan type. With no film career and nightclub life as flat as last night’s champagne, Guinan went on the road with her troupe of beauties, garnering much publicity when they were turned away in France. 1932 passed into 1933. Prohibition was winding down. The Depression gearing up. Broadway’s musical theater spots were yielding to the talking picture musical. In the wee hours of the New Year Guinan’s former employer Larry Fay was shot to death at his current nightclub by a disgruntled employee. Fay’s passing recalled the bright days of glittering Broadway, for which there was already a growing nostalgia. Guinan and her 50 beauties, after appearing at the Chicago World’s Fair, made a return trip to Los Angeles in September 1933. (2). 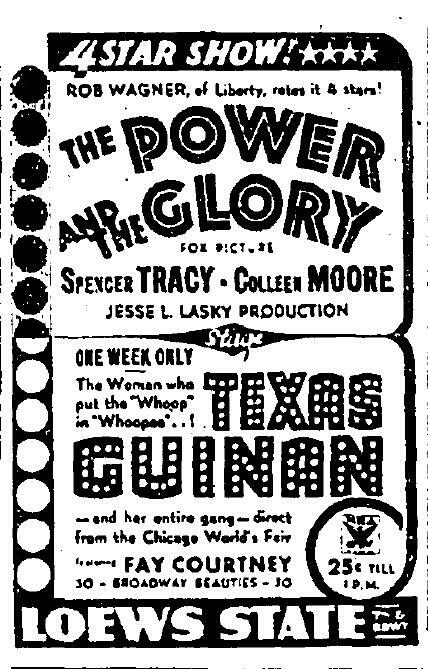 Texas Guinan, “the woman who put the ‘Whoop’ in ‘Whoopie’” appearing once again ion the Loew’s State stage the week of September 15, 1933. While here, Texas also put on a show at the Cocoanut Grove, rode a bull in a stampede at the Rose Bowl and finally visited the Angelus Temple (though Sister Aimee was away on tour at the moment). She teased reporters by proclaiming she might take up the gospel trail herself. 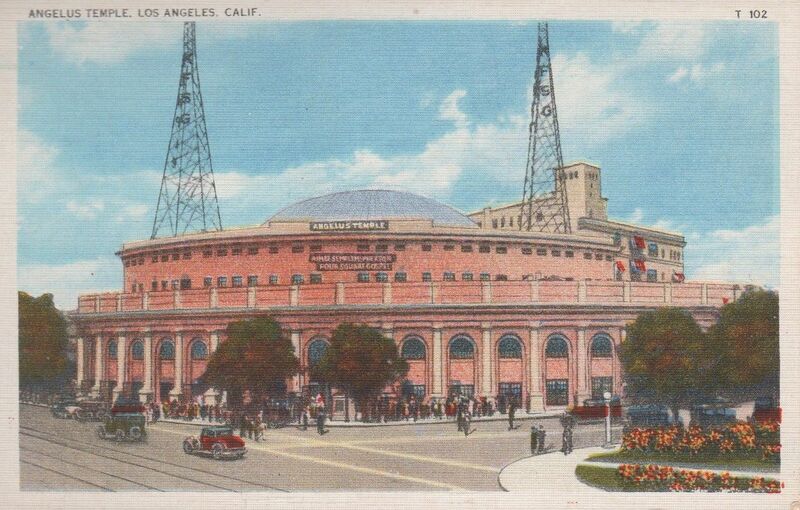 An early 1930s view of Aimee Semple McPherson’s Angelus Temple. 9-17-1933. Texas contemplates giving Sister Aimee some competition on the gospel trail. Los Angeles Times. Texas played a small role in the 1933 film Broadway Through a Keyhole, written by Walter Winchell, as nightclub hostess “Tex Kaley.” The film premiered in Los Angeles on November 1 at the Grauman’s United Artists theater. Broadway Through a Keyhole opened at Grauman’s United Artists Theater, 9th & Broadway, on November 1, 1933. By then, Texas had left town, having taken the tour to Portland Oregon, then on to Vancouver, Canada. There she contracted dysentery and died on November 5, 1933- one month before the repeal of Prohibition. Texas lived on in the imagination of Hollywood. Gladys George played a Texas Guinan-like character, “Panama” Smith to James Cagney’s fictionalized Larry Fay in Mark Hellinger’s The Roaring Twenties (1939). In 1942, Marjorie Rambeau played another fictionalized Guinan, Lil Rice, in Broadway. In 1945 she was portrayed by Betty Hutton in the highly fictionalized biopic, Incendiary Blonde. (1) As a curious aside, both Vollier and Sherman would later be identified as suspects in a double homicide that occurred at the Bella Napoli Café in Hollywood in August 1933. (2) Texas’ former manager Harry Vollier was in Los Angeles at the same time as her visit. He was picked up in an anti-gangster drive and held on the catch-all charge of “vagrancy” September 19, 1933. He was soon released but picked up again in November on suspicion of murder related to the double homicide of two men at the Bella Napoli Café in Hollywood. 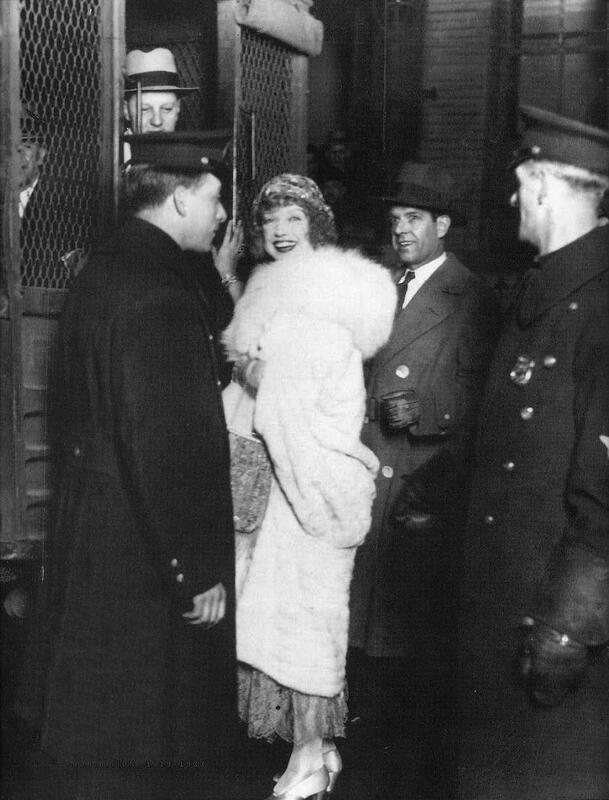 Though released on those charges, later that year he was arrested in connection with the theft of jewelry belonging to Mae West. The case went on for several years until he was eventually cleared of the charges in March 1938.